Bo Pelini « Hercules and the umpire. Bo Pelini, the Nebraska football coach, who taught young boys to be good men, was fired yesterday. You might also be interested in Nebraska’s advertising slogan. Mark walked on at Nebraska to play football from a small high school in Ohio, not far from the Pennsylvania border. He was very smart but very small. He wanted to play on the offensive line for the Nebraska Cornhuskers. The head coach, Bo Pelini, looked at his film. While doubting that the kid would ever play, Coach Pelini told Mark to come on out and we’ll see what happens. Of course, Mark would have to pay his own way. Mark stands six-foot tall, according to the program. That’s probably a lie. The program says he is up to 290 pounds, but that is probably a lie too. But, Mark tried, and tried hard. That he knew the playbook, and the proper line calls, as well as the offensive line coach helped him. His smarts showed as he became an Academic All-Big Ten award winner on multiple occasions. 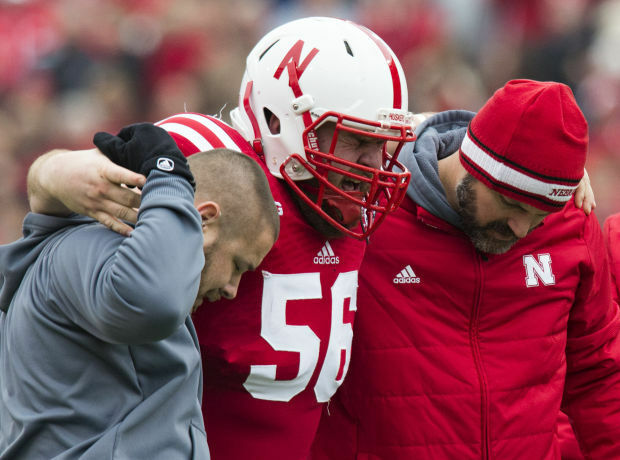 That he started at center on the 2014 Nebraska football team was nothing short of a miracle. He was likely that smallest man to play that position in the Big Ten. So it was on Saturday, November 22, 2014, that Mark played his last game at memorial stadium in Lincoln. It was Senior Day. Mark had reason to be proud as they announced his name. The chances that he would be the starting center for the ranked Huskers were vanishingly small when Mark first walked on at Nebraska. It was a wonderful day for Mark. That is, until the first offensive play of the game. Mark snapped the ball, engaged the man across from him and the play ended. As it did, an opposing player rolled up Mark’s extended legs from behind. Mark fell with more than 300 pounds of opponent pinning one of Mark’s leg. His stout leg couldn’t bear the force and it twisted and wrenched back and forth. Mark writhed in pain. Mark (56) grimaces as he his helped off the field in the first quarter at Memorial Stadium on Saturday, Nov. 22, 2014. As Mark lay on the ground, head coach Bo Pelini jogged on the field of play to comfort his center. One play on Senior Day was all that Mark would have as a memory. All that work. All that study. One play. The best day of Mark’s young life turned into the worst. They carted him off on a golf cart, and he returned to the sidelines barely able to walk with crutches. Bo Pelini the head coach at Nebraska talks to his young men a lot about dealing with adversity and thereby learning important life lessons. I hope that will be enough for Mark Pelini, Bo’s nephew, and the bright and hard-working young man who epitomizes the best of big time college football. If nothing else, Uncle Bo ought to be damn proud.